A largely unpopulated, parched land of deep red desert, spectacular rock formations, and small, isolated settlements, Northern Territory has perhaps the most distinctively Australian aesthetic of all the country's states. The region's towns and cities are clustered around the Stuart Highway--the iconic road that serves as Northern Territory's main artery--rather than the coastline, as is normally the case in Australia. Darwin: Australia's northernmost major city serves as the access point for most Northern Territory holidays, with modern architecture and services complementing a year-round tropical climate and an abundance of beaches. Alice Springs: If your Northern Territory itinerary takes you to the Red Centre and Uluru, you're bound to pass through this oasis town, a beacon of tourism and agriculture industries in the vast desert plains. Katherine: The gateway to some of the region's most scenic national parks, this former telegraph outpost is now one of the most popular Northern Territory places to visit. Yulara: Established in 1976 as an accommodation hub for tourists, this desert town sits just a stone's throw from Uluru and offers easy access to the area's scenic rock formations. Uluru: No Northern Territory itinerary is complete without visiting this giant, spiritually significant red rock, which juts out from the desert landscape and changes shades of red as the day goes on. : Enjoy the sunset at this iconic Darwin beach, where you can stretch out on the sand, go for a dip, or browse a range of independent stalls selling handmade artwork, crafts, and souvenirs. : Wander through the hallways of this extensive gallery and museum to admire Aboriginal paintings, modern artworks, and a range of exhibits relating to the region's nature and animal life. : Often overshadowed by the iconic Uluru, this formation of 36 massive red rocks nevertheless remains one of the most popular Northern Territory attractions, providing opportunities to explore and admire the ponds that form between the rocks. : Immerse yourself in this detailed interactive exhibit to learn about the 1942 bombing of Darwin, in which Japanese forces attacked the northern city but were unable to advance any farther into Australia. : Explore this beachfront district in the state capital to find an enormous wave pool, a sheltered lagoon perfect for taking a dip, and an array of retail outlets just minutes from the city center. : As its name suggests, this wildlife park will add some extra bite to your Northern Territory holiday, with the chance to feed and even swim with crocodiles in a protected area. : Bring the kids along to play with kangaroos, admire native birds, and seek shade among the trees of this desert park, still largely run by members of the indigenous Arrernte people. : Known for its tropical rainforests sprouting from the red earth below, this extensive national park within easy reach of Darwin contains an incredible cluster of large termite mounds, which from above look like the ruins of an ancient city. : Just outside the small but important town of the same name, this pristine gorge stands out as one of the highlights of Northern Territory tourism, with an abundance of native animals visible onshore as you float down the river. Your Northern Territory holiday can likely be broken down into two regions--the tropical north and the Red Centre. To show the kids the region's most iconic attractions and some red desert scenery they'll never forget, fly into Alice Springs, then head down to Yulara to base yourself near the famed red rock. Make sure you visit Darwin during your Northern Territory vacation to let the kids admire crocodiles and some of the region's other tropical animals at a range of wildlife centers, then make your way to Katherine, where they'll be able to explore a wild rainforest. 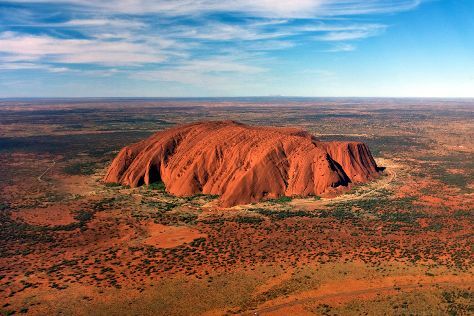 One Northern Territory attraction tops them all--Uluru. , an often underrated but equally impressive network of massive, interconnected boulders where the kids can pretend they're in a fantasy world. , where they can frolic about in a giant wave pool. As with most places in Australia, Northern Territory tourism focuses primarily on nature, so your little ones will have to spend a lot of time outdoors. Bring plenty of sunscreen, insect repellent, and drinking water to help the kids cope with the oppressive conditions. If visiting desert destinations during your Northern Territory holiday, make sure you pack some warm clothes for the little ones--while it's scorching hot during the day, the temperature can plummet at night. Australia's notorious wild animals thrive in the region, so make sure you keep a close eye on small children to stop them straying from marked paths. You can also take a food tour of the area with a local guide, who'll teach you about the techniques used to prepare bushfood and native meats, such as kangaroo, emu, and crocodile. Make sure you try damper on your Northern Territory trip--this simple bread made over an open fire provides perhaps the most authentic taste of the region. If you visit the state's coastal areas, ask for freshly grilled barramundi, a fresh or saltwater fish known for its delicious white flesh. The region's large landmass and low population density means you'll find relatively few shopping options outside the main cities during your Northern Territory vacation. Darwin offers the best range of options, with a handful of well-balanced shopping malls offering both local and international brands, as well as distinctive night markets, where you can find a range of fresh, locally grown produce. --a Darwin-based gallery selling genuine Aboriginal artwork and handicrafts--for a chance to buy paintings, woven goods, and ornate didgeridoos to remember your Northern Territory trip by. Pleasant weather conditions make July and August the best months to catch cultural events and festivals during a trip to Northern Territory. The festivities in Darwin kick off with Royal Darwin Show--a carnival with plenty of rides and attractions for the whole family--then carry on into August with Darwin Festival, which offers a combination of music, arts, and live performances. Add Darwin Aboriginal Art Fair to your Northern Territory itinerary for a chance to acquaint yourself with the local indigenous culture through traditional dance performances and art exhibits. Simply put, the climate in Darwin and other northern and coastal Northern Territory destinations is hot year-round, with average temperatures hovering around 32 C (90 F). The dry season, between May and September, serves as the best time to holiday in Northern Territory, with pleasant conditions and minimal rainfall. The wet season (October to April) can provide more difficult weather. Top destinations like Alice Springs and Yulara have a hot, dry climate, with scorching daily maximums from October to March, but extremely cold nights between April and September. Dusty desert roads stretching as far as the eye can see and an incredibly sparse population present some challenges when organizing a Northern Territory itinerary. Save time, money, and effort by flying between major destinations, such as Darwin and Alice Springs, from which you can generally take buses to nearby attractions. If you vacation in Northern Territory with a family, consider booking a tour or an organized day trip to see isolated attractions like Uluru and Kata Tjuta, as driving through the desert can provide difficulties for those who haven't done it before.